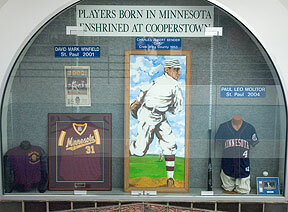 About the photo: A display in the museum of the Minnesota Amateur Baseball Hall of Fame saluting Minnesotans in the National Baseball Hall of Fame. Shown are objects related to Bender, Winfield and Molitor. Deano Thilgen photo. The Halsey Hall Chapter of The Society for American Baseball Research (SABR) is based in the Twin Cities of Minnesota and serves the entire Upper Midwest. The Halsey Hall Chapter 2019 Spring meeting will be Saturday, May 18 at Faith Mennonite Church, 2720 E. 22nd Street in south Minneapolis. Read the current newsletter for details. Save the date! The SABR Minneapolis 19th-Century Baseball Interdisciplinary Symposium will take place on Saturday, November 16, 2019, at the Minneapolis Public Library, 300 Nicollet Mall in Minneapolis, Minnesota. Current chapter newsletter is the April 2019 Edition. See the membership page for My SABR access instructions.